2. Images must be RGB colour mode, (images saved in CMYK will not upload). 3. Try to limit images to 60 kilobytes or less which will allow fast display for all website visitors. (Larger images will however upload). 5. The HOME PAGE image will display at the full size of the image you upload. Ideally the HOME PAGE should be less than 350 pixels high and less than 800 wide. 6. The LOGO image will display at the full size of the image you upload. Ideally the LOGO image should be less than 80 pixels high and 150 wide. 7. Other images should be at least 70 pixels high and at least 400 wide. It is recommended that images uploaded to GALLERIES are approximately 600 pixels wide (portrait) or 600 pixels wide (landscape). > NOTE: all images uploaded will retain their proportions. Images uploaded into your galleries will default to 400 pixels wide. You can change the size each image is displayed at, by adjusting the image width in your back office. > NOTE 2: The artHIVES editing system does not require you to upload thumbnails, only full size images. > NOTE 3: Uploading images to your website requires balancing quality of image vs. speed to load. Higher quality images will be larger files, be slower to load and potentially be off-putting for visitors with slow internet connections. When resizing images using Photoshop, choose a quality level around 5 as this should give you an image that is not too large and of a sufficient quality for web publication. It may be necessary to experiment with the quality level to strike the right balance between file size and quality. When you first subscribe to artHIVES you will not be able to activate your website so that the front end is viewable by the public until artHIVES has fully processed your payment. You will however, have full access to your back office and will also be able to preview your website via the PREVIEW MY WEBSITE link in the HEADER of your back office. Once your payment has been approved you will notice that an ACTIVATE MY WEBSITE button will appear on the main menu page of your back office. You can activate your website by clicking this button. 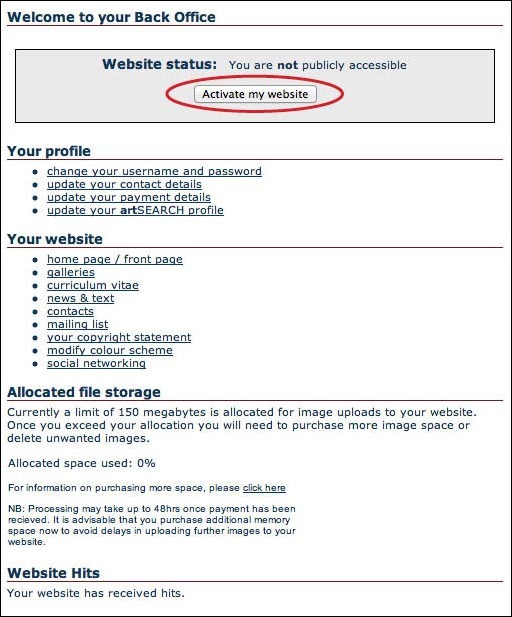 Once you site is active the ACTIVATE MY WEBSITE button will be replaced by a DEACTIVATE MY WEBSITE button. You can deactivate your site at any stage you wish by clicking this button.